The cakes themselves are a combination of strong instant espresso with a a hint of vanilla, whilst the tops (the froth on the cappuccino) is mostly made up of white chocolate. A wonderful combination! 2. In a food processor add all the cupcake ingredients except the milk and pulse to combine. 3. Add the milk and pulse again until the ingredients are well combined. 4. Place 12 cupcake liners into a muffin pan. 5. Spoon the batter into the liners. 6. Bake for around 20min (until a slight golden brown color). 7. Let sit for 5 min and then place the cupcakes onto a wire rack to cool down completely. 1. Melt the white chocolate and butter in the microwave. 2. After it has cooled a tad, add the sour cream and stir. 3. Gradually add the sifted confectioners sugar until it is a good consistency (malleable, but not wet). 4. Spread the icing on top of the cupcakes and then dust some cocoa powder on top. Taken from "How to Be a Domestic Goddess: Baking and the Art of Comfort Cooking" by Nigella Lawson p. 199. They looks excellent...like perfect little cappuccinos!!! how pretty! sour cream icing..mmmmm. 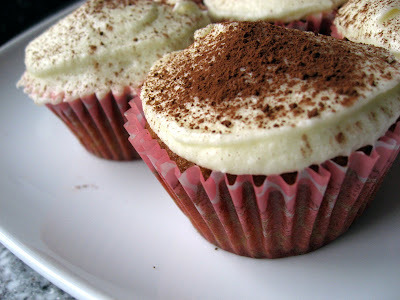 I agree with Ginny, the perfect little cappuccino cupcakes! I bet they are tasty! They look perfect! I love sour cream frosting. What great cupcakes! Love the flavor combos! Thanks everyone - they were very tasty indeed!